I Wonder If She Misses Me As Much As I Miss Her*. When most people are asked where they would go for a dream vacation, common answers given are exotic locations like Hawaii, ski destinations like Whistler, or luxury-type trips like Alaskan cruises. Those destinations are great and I certainly wouldn’t turn down the opportunity to visit any of them, but they’re not at the top of my list. I have lots of “favorite places”, but one international location stands out above the rest in my mind: Germany. I know I’m not the only non-German who adores that country, but by and large, Germany is not typically on the top of anybody’s list for a vacation. Other places in Europe make the list: London? Sure! Paris? So romantic! Venice? Gotta ride in a gondola! But Germany? Hmm. I’m not sure I’ve heard anyone tell me–EVER–that they’d just “love to go to Germany” unless they’re taking a side trip there on their way to Greece or something. I won’t analyze why that is right now, because I’m not the one with that issue. I have been there twice; the first time I lived there for a full 30 days as a 14-year-old. The second time was in 2006 and I was there for less than a week, helping Kate take care of toddler Bean and going on mini-field trips while Kate’s husband was participating in a conference. I love it there. I feel at home there. The history, the castles, the attitude. I love the language; I love the challenge of trying to read what’s around me and understand what I hear. The accent, though harsh-sounding to some, makes me intensely happy. A German-speaker does not sound flowery, that’s for sure. Case in point, Hogan’s Heroes. But that was Old Germany. New Germany is prettier, more savvy (yet still to the point). Think Heidi Klum. I want to be “Heidi’s” BFF. 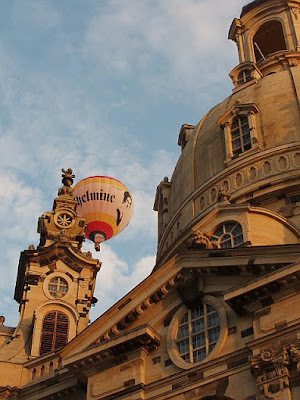 During my 2006 trip, I was in Dresden, which is located in the part of the country that used to be East Germany. Luckily for me, many of the people there didn’t speak a bit of English as most do in the West, and I got to dust off what I once knew about the language to see if it still worked for me. I was thrilled that the five and a half years of German I took (starting in 8th grade) in the 1980s came back in 2006. Well, not all of it came back, of course, but enough of it did. I was able to get Kate and I around on our little sightseeing excursions and ask people for directions and understand servers at restaurants and speak to the front desk people at the hotel. It was So. Much. Fun. And I miss it. On our final evening there, the original plan was for me to stay in the hotel room with Bean while Kate and her husband went out to eat, just the two of them. Long story, but that didn’t work out and hubby stayed in the hotel room with a very crabby Bean, who, after a few days in England/Wales and then the Germany portion of our trip, was completely DONE. Overdone. But she was just short of two years old, and a European tour is a lot to ask of a kid that age, so a quality evening with Daddy was just what the doctor ordered. Kate and I ended up walking to the historic part of town for a lovely dinner outside, in the shadow of the Frauenkirche, a most spectacular church. The history of it is fascinating; click here to read it. We sat at our little round table, reminiscing about our trip together as we ate. It was bittersweet because I had to get up early the next day to fly home, and they were traveling on to visit friends in Austria. We talked and laughed, and sometimes didn’t say much at all. It was a beautiful evening. I took this picture from my seat at the table. When I look at this, I am swept back there for a moment; it’s dreamy. *Yeah, yeah, I know: countries don’t have the ability to experience feelings. Whatever. Germany does sound like a place I want to visit. My parents went their once and my dad always wanted to go back. I've never thought about Germany as a place to visit, but you make it sound intriguing. I will put it on my list of places to visit if I get to Europe again. The photo is gorgeous. I'm with you, our next major trip will most likely take us to Holland where my wife's sister lives, but we will hopefully make the drive to Germany. I've been dying to go for years, and my wife's family is spread out all over the place there. I'm really kicking myself for taking Italian in college instead of German. If I had only known then I was going to marry a first generation German girl whose parents made sure their kids could speak the language. I've been to Germany once, and it was beautiful, clean, the people were friendly and there was beer…lots and lots and lots of it (it was in October). I'd love to visit again!!! Wow, I'm impressed, I took 5 years of French and always received A's but I can barely remember how to say "My Name is…" That's amazing that after all that time, you were still able to speak fluently enough to get around. That shot, ohhh it takes me back. I want to go to Germany again (hey, I'll go with you 😉 ). The last time I was there was for two weeks when a friend was working in a tiny TINY town called Vilsbiburg about 45 minutes outside Munich. Not a SOUL spoke English, which made life fun for me, but I actually could understand at least some of it. Enough to get around anyway! We had so much fun — I loved wandering around the town while he was working, and we took a couple side trips into Munich that were a blast. That picture is SO Germany though. SO Germany. Thanks for making me miss that life. Wow, Germany sounds like a beautiful place. I'd love to go there. Someday, perhaps. I have always, ALWAYS wanted to go to Germany. Thanks for sending me the links! I could spend all day looking in churches. The architecture is just breathtaking!